This recipe makes the bitterness of garden eggs shine through. The green garden eggs are more bitter than their white counterparts. Either way, the sugar and spice work extremely well to create a balanced ‘condiment’ that tastes Africa, smells Indian, and eats well. 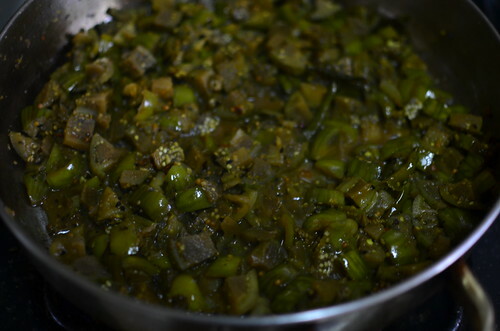 In the manner of Thakkali Chutney. Weeks ago, my friend Deepa of Paticheri explored the world of chutneys and relishes in India in ‘The Great Chutney Mystery’. After journeying round the world from Wikipedia to websites and blogs, studying various relishes and condiments, she discovered that names are names as far as they are names. That names can mean many things to many people in many places and finally, she has landed on a definition of chutney which I buy. 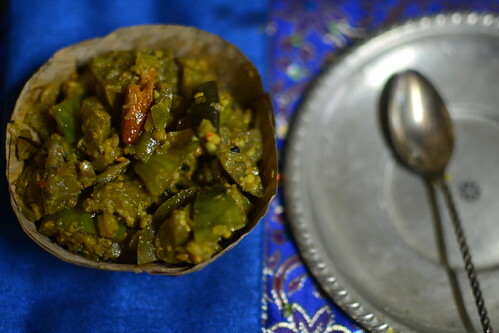 Chutney: Catch-all term to describe a ground-together condiment that accompanies Indian snacks and light fare (from dosas to samosas), rice-based dishes or plain rice (also in India), and meats (in the West). Chutneys typically combine spice, sourness, and sweet tastes, in varying proportions. 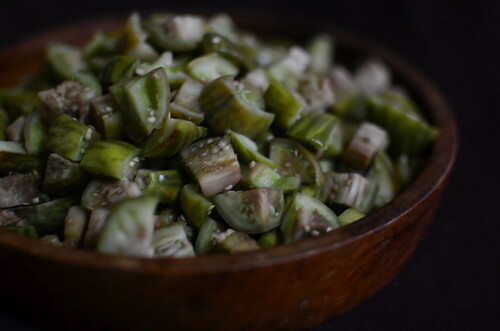 They can be fresh (coconut chutney), lightly cooked (tomato/thakkali chutneys), or more picked (Major Grey’s and other commercial chutneys). 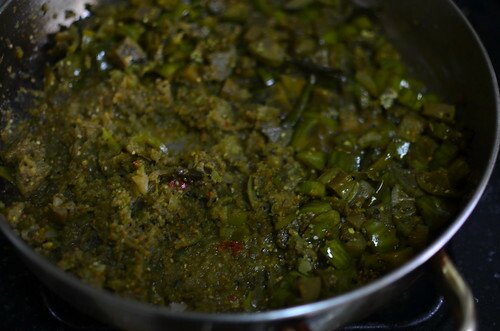 Because what I’ve made includes some puree, and ground-together ingredients, I dare call it chutney. Bittersweet chutney no doubt but chutney nevertheless. Use the white garden eggs if you want to temper the bitterness for the green retains every bitter cent of its character but its oh so delicious! Begin by cooking the garden eggs in hot water, about 10 minutes, not to aid taking off the skin, but to soften them. Once cooked, remove the garden eggs from the water, ‘shock’ in cold water and then remove and allow cool, till you are able to handle them. My original plan was to skin the garden eggs so I hatched the bottoms, but it didn’t work. This method didn’t allow me do take the skin off easily, so I went on to cook them skin and all. Once they are cool enough to handle, roughly chop into centimeter large pieces. In a medium-sized pan, heat 2-3 teaspoons of oil till warm. 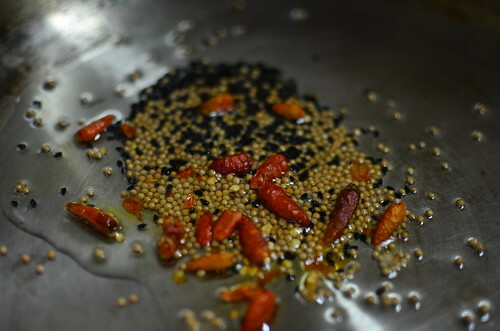 Add the onion seeds, mustard seeds, and dried red chili peppers. The mustard seeds will sputter, after mere seconds. Beware. Follow by adding the garlic and ginger paste. Stir briskly for a few seconds, and then add the roughly chopped garden eggs and water. 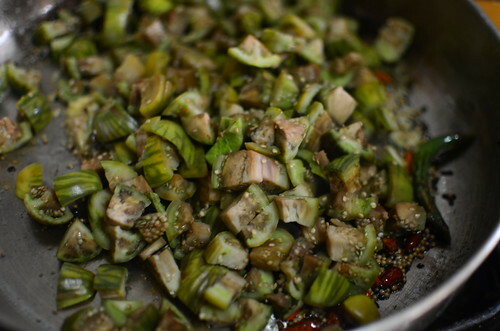 Mix again, and allow to cook until the water is reduced by half and the garden egg chunks soften, about 20 -30 minutes. Once cooked, remove from the heat. Puree a third of the cooked mixture using a hand blender, while in the pan. Alternatively, put in a blender or food processor and pulse till a puree forms. Stir the puree and chunks together and then ladle into clean jars. 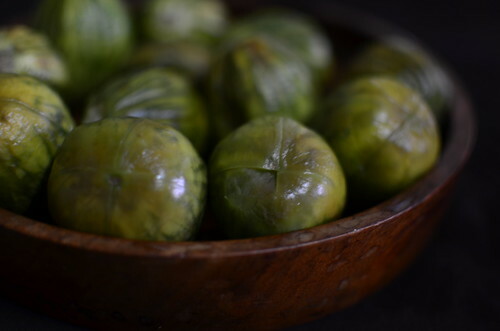 Refrigerate for 1 – 2 weeks. 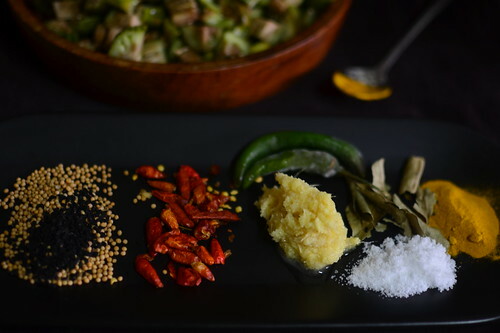 Optional: dry roast and powder 1 tablespoon sesame; sprinkle on top of the cooked chutney. 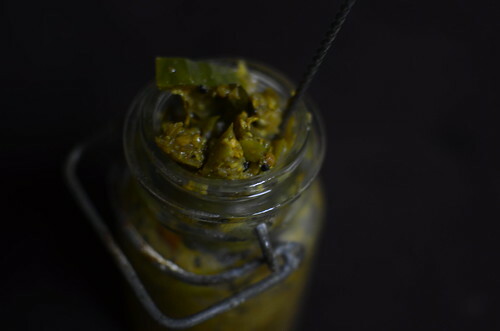 This chutney can be served hot – gently warm the chutney. 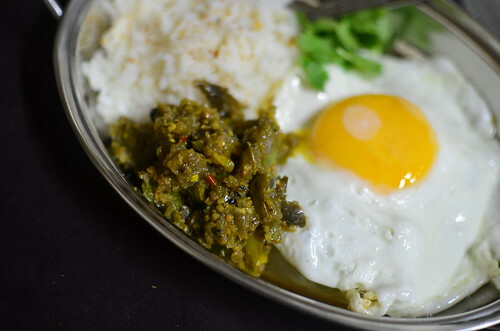 It can also be served cold which was how I had it, with rice, cilantro (a must), a sunny side fried egg, with runny yolk (for sauce). Its was awesome. The garden eggs retain their shape but are soft and well-flavoured, from sweet to salt, and spice. So I followed Deepa’s advice alright, to serve with rice, rotis, or with omelettes and eggs for breakfast. And I dare say lunch and even dinner. I look forward to having this stuffed into the centre of a crunchy baguette, perhaps with shredded chicken or other meats. Maybe some avocado. Maybe not.